“So sweet. This is the second time she’s come to support Oceana,” board member Ted Danson told me about Hillary Clinton as he excused himself and checked his phone to see if his wife (Mary Steenburgen) had arrived at the Beverly Wilshire. “She and Mary,” he continued about Clinton, “they’ve known each other forever. I’m also touched that Richard Plelper, who I worked with on Bored To Death, is here.” Security was beefed up at the hotel—it was so tight in fact the secret service wouldn’t let me in to the gala (the nerve! ), just cocktails and the red carpet. Apparently I can be trusted around George Clooney but not the former Secretary of State (and potential presidential hopeful in 2016). Jane Fonda and Melanie Griffith actually took a seat on the carpet, on a ledge along the wall, waiting for each other to give interviews, and Carly Simon swanned by. Simon performed later with Natasha Bedingfield and the Hamilton High School Choir (Hamilton performed at the Fulfillment Fund last week as well! Busy kids). 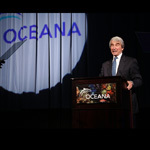 Who else stopped by to raise nearly $1 mil for the org keeping the oceans clean and full of fish? Diane Lane, Sam Waterston, Ed Begley Jr, Angela Kinsey, Oscar Nunez, Kristin Davis, Norman Lear, Laura Dern, Philippe Cousteau Jr., Harvey Weinstein and Kate Walsh, among others. Previous articleComing Soon: 800 Degrees Downtown, Scopa in Venice, Joan’s on Third in Studio City, and More!